Now they have fully embraced the Agenda 21 “Make everywhere look like a nondescript place in Europe” 3 or 4 story apartments or apartments over shops. Along the way destroying the Strip Mall designs with front parking and storefronts, often as detached houses converted to shops. – Joe’s Partner passed away. This resulted in legal issues that forced them to close for 3 weeks so they could reincorporate. – The owner of the building decided he could make more money building condos and forced them to move. I went over and helped them move some. It was a massive job. It literally took 100s of truck loads. – He had multiple family tragedies. I was there last night because a moron in a tour bus side swiped my 65 Mustang. Joe wrote up the estimate and gave it to the insurance adjuster. I don’t know about other cars but Joe’s knowledge of classic ford is 2nd to none. The insure adjuster did not even try to write the estimate. He just asked Joe to do it. The racks are setup, the tons of parts are getting organized, and they are slowly getting their feet under them again. The front showroom is in the process of being painted and set up. The progress in the last month is massive. Hang in there and support your local classic car shop. There’s nothing quite like a “Big 8”. Or a Mustang. The Roomie had a Hobie Cat. 16 foot IIRC. Now these don’t weigh much at all (maybe 200 pounds) but they LOOK big. One day, coming back from the lake, a Chevy Camaro was next to us. He thought he was hot stuff and had not seen the boat being towed behind the Ford. The Mach One had a BIG engine… Motors revved at each other at the light. vroom Vroom, VROOOM VROOOM… Light changed, at about 50 MPH the Mach One had to leave first gear… Nothing like never missing a shift from 0 to 50 mph ;-) and we slowly pulled ahead of the Camaro… As his passenger saw the boat. Oh, the laughing!!!! RIP Mustang Ranch… Long Live the NEW Mustang Ranch! This entry was posted in History, Human Interest and tagged Ford, Mustang, Ranch. Bookmark the permalink. The Mustang Ranch looks like a place I’d visit every month or so. There are tons of Model A Fords in great condition under $20,000. I have also been looking at ’55 – ’57 T-birds, but by the time I read about one in good condition at about $30,000 it’ already sold. I also have been looking at ’59 Cadillacs. I may get lucky there. There are some that have started coming on the market at more affordable prices. I think it’s because classic trucks (’40s & ’50s) have been taking off. I came this |—| close to buying an immaculate 2004 Mercedes SL600 AMG with just over 60,000 miles on it. We were getting ready to leave for Florida and I just didn’t have time to move on it, to my current and unending regret. Yes, yes, yes! Having a cruiser would be great fun, E.M. I does take one back to the ’60s and early ’70s. Frankly, the new styles look to me like hurricane-battered Belize City when I was there decades ago. No paint on the buildings except the pink convent. I can understand why Belize City’s buildings are (were?) unpainted. If you get hit by enough hurricanes, you run out of money to repaint. But would someone explain to me why modern American decorating trends are so repulsive? I love that story about the “sleeper” pickup vs the Mach One. And the car towing the boat that showed up the Camaro. C’mon, Larry (aka Hotrod). Let’s hear some stories! My older brother, by 2 years, had a friend with a ’66 GTO with a 389 Tri-power bored .030 over and with the 3.90 3-speed. THAT is my never-to-be-had dream machine. Because of the gearing, he could barely keep up with the pony cars up until about 90 mph. Then he’d hit third gear and it was all over. The cars with the 4.11 gears like the Camaros, and Judges would start sucking wind at about 125 mph; gear and rpm limited. That ’66 was in torque heaven and just blew by to about 140, headlights in the rear-view mirror. That guy was smart. Never raced anyone over 1-2 block distances when in town. That ’64 Scout was a babe magnet! I taught many a girlfriend du jour to drive a stick because they couldn’t burn out that 5-ton dump clutch. That, and it was so different from the Mustangs and Camaros the other guys were driving that they couldn’t help but be eager for a ride in the Scout. 0-60 was measured with a 3-minute egg timer. I was into rock climbing and caving at the time, so I liked my friends’ muscle cars, but I needed off-road capabilities for myself. I did appreciate that the interior only required a garden hose for cleaning; no vacuum cleaner necessary. A pristine ’64 Scout frame off restoration, if you can find one, is well north of $100,000 nowadays, so I hold no hopes of ever owning a like-new version of my first car. Ummm okay, I bought my first car when I was 14 (2 years before I could drive). My uncles father had a 1953 Studebaker Champion, which I fell in love with, but it did not have much power. Then I stumbled across an article about the Studebakers that they ran out a Bonneville like this. That was my big mistake. I bought a 1/25 scale Studebaker model and was tinkering with it studying the aerodynamics of the body. At the time I also had a model of the 1964 Dodge, I was fiddling around with a metric scale ruler (1 inch equals 25.4 mm, so for all practical purposes a mm on the ruler was 1 inch on the real car.) The frame of the Studebaker was too light to take a big engine but the big Chrysler engines were bolt in swaps on the early Dodge torsion bar frames. The Studebaker frame was a ladder frame with a wide spot in the middle and by measuring I realized that near the fire wall the Studebaker frame was exactly as wide as the much heavier Chrysler product frames. That is when my evil plan was formed. I shopped around in the used car listings and found a 1954 Studebaker Champion coupe (inline six engine) for $400 after pleading my case, my Dad helped me buy it and I had to pay him back before I could drive it. Well what does a 14-15 year old kid with a car do? He takes it apart. I pulled the entire body off stripped it to the frame and found a 1955 Chrysler Imperial with the 331 cubic inch hemi in it and bought the entire front half of a 1957 dodge torsion bar frame cut off right behind the cross member where the rear of the torsion bars tied in. Two years later I had grafted the front of that Dodge frame onto the rear of the Studebaker frame, I had to take a couple leafs out of the Studebaker rear springs to get things to the correct ride height ( this will come up again shortly). I by this time was a senior in high school working at a 24 hour Mobil gas station owned by a guy who liked to drag race and held the local drag racing record for his class. In short he let me fiddle with the car in the bay when it did not get in the way of work. 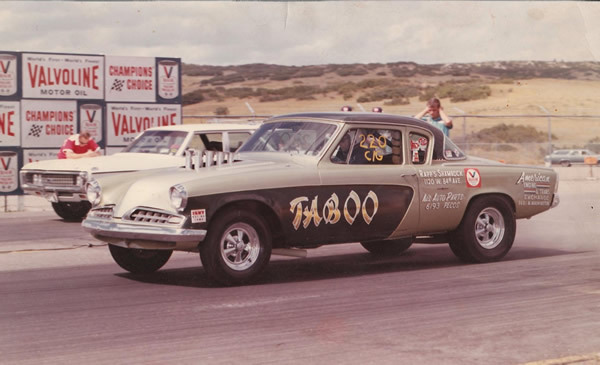 The 331 hemi was a lower power version of the iconic 392 hemi that was often used in the dragsters and big altereds etc. but this was bone stock. I had to figure out a way to shift the transmission. It came with a simple 2 speed automatic called a power flight which luckily had a very simple mechanical shift linkage that simply had to be moved forward or back to shift it. I took a 22″ bolt and forged a flat spot in the bolt about 6 inches from the end and drilled it and connected linkage. It had no lockouts of any kind it had a simple shift pattern of Park, reverse neutral drive and low. Low as all the way back on the shift lever and Park was all the way forward. I was still working on the throttle linkage so temporarily connected a wire through the fire wall to the carburetor so I could rev the engine by pulling the wire. This is where the fun begins. The day came to fire the engine and after playing with it a bit I got the engine to run. (I had no front fenders or grill on the car just a naked engine with open headers forward of the fire wall). I started the engine stepped on the brake and blipped the throttle once and then slid the shift lever into reverse and at an idle backed it off the lift and out into the drive. I then decided it would be a good idea to rev the engine and just slap the gear shift into low. Whaaaaass whap whap the car squatted for a moment and launched forward about 6 feet much harder than I expected and it felt like the car got up on its tip toes as is did the burn out. I slapped the shift lever into neutral and hit the brakes and sat there very pleased with myself until I realized the car was sitting a bit crooked. I shut off and got out and looked over the car and sure enough the left rear was sitting a lot lower than the right rear (it had however left some nice black stripes on the drive asphalt). I crawled under it and it immediately became apparent what had happened. The torque hit had slammed the nose of the differential upward so hard it had twisted the left rear spring hard enough to have bent the main leaf to about a 15 degree angle right in front of the rear spring hanger. To paraphrase the movie Jaws “we’re going to need bigger springs and some traction bars”. I put Chrysler imperial rear springs on it which interestingly enough came stock with built in traction bars, and after I quit breaking drive shafts I put a rebuilt 392 hemi in it, (bored 0.060 over, with 10:1 pistons multi angle valve job and a Crane came and kit rated to 6200 rpm) That gave it a displacement of about 406 cubic inches. After much scrounging at the local junk yard that I spent a lot of time at, I picked up an Aluminum case Torque flight automatic transmission and the limited slip rear differential he had. The car was wrecked by someone who got in trouble trying to evade the police, and he practically gave it to me if I took the parts off the frame. At the time one of the hot modifications to improve oil flow was to shim the oil pump relief spring, so I took the plug off and since to a 16 year old, more is always better, instead of a single thin washer I put a 10/32 nut in behind the relief spring. Repeat trial fire episode one above, backed it off the rack by hand ( I now had real throttle linkage on 2 of the biggest AFB carburetors manufactured. (you could literally drop a 50 cent piece down the secondaries if you held the throttle open.) Once out in the drive I hit the starter button and the sweetest music in the world – – is the instantaneous fire up of a new tight engine. The engine probably did not complete a full revolution before it fired, I watched the oil gauge slam to the peg and stream of oil shot across the parking lot. I killed the engine got out and crawled under the car. The oil pressure probably hit something like 250 psi that moment it hit full idle rpm and it squirted the rubber gasket out between the oil canister and the mounting plate. The oil filter looked like a dog with its tongue hanging out. I put it back on the rack and took that 10/32 nut out of the oil relief pressure and topped off the oil. Repeat rolled it back out into the lot and fired the engine again and it roared to life (only had the exhaust manifolds on it) and I punched the button for the torque flight to shift into drive and the car moved off the line but it felt sluggish. Crap the junk yard transmission must be toast. I left the car with him, and he told me he would call me when it was ready. I expected him to take several days to pull it apart and figure what was wrong with it. I dreaded the repair bill. I got a call on Friday night, the car was ready and I could pick it up any time. He explained that the racer who had owned that car the torque flight came out of, had put a modified valve body in it, so it was manual only shift pattern and had a high stall converter. If you put it in drive you got 3rd gear only. I had been in high gear when I had tried it at the gas station. My mom drove me over to the shop on Sunday morning to pick up the car, she was in our 65 dodge and I got in my car and started the car and punched the low gear button and the Stude moved away as pretty as you please. Okay 18 year old kid, first time in his car with proper power and transmission, 7:00 AM in the morning on a Sunday and almost no traffic. I drove carefully out of the shop and headed west and we got caught at the light at Federal. I am in the Stude (in the lead) no cars around except my Mom behind me waiting at the light. I waited at the light, pushed down hard on the brake and punched it in low and brought that 406 CID hemi to a fast idle. You could feel the engine torque winding up the cars frame, the car literally rose up about 2 inches in the rear as the springs and traction bars got fully loaded. The light changed I came off the brakes, and mashed the throttle and left two nice dark rubber streaks across the intersection. I instantly backed off, but it was not a bad burn out. My Mom was not amused! She had a bit of a scowl on her face in the rear view mirror as she came up behind me at the next light. I drove home carefully. She never said a word to me about it, but I would have loved to see my dads face as she described it to him. @p.g. : That 4-cylinder was loud, and of course the only soundproofing, if you wanted it, was cotton in the ears. At 70mph on the freeway – heck, even 55mph – conversations were shoutversations. It was also the easiest starting engine I have ever seen. The starter went out on my Scout, the local IH dealer didn’t have one in stock and there were zero available at parts stores. In those days, it was a week before I could get a starter. So, I parked on down slopes so slight that no one would notice that the area was not level. All I had to do was get it rolling and within 5-7 feet it was running. @Larry: Good story! That sounds like a great first car. And your parents were smart. Until you got your car running, they at least always knew where to find you. You left off paint. You had plenty of time to get paint on the car while you were fussing with the mechanicals and I assume you did it yourself, although you could get a good paint job from Earl Scheib for $29.95 if you brought in the body parts. Assembled cars? Well, not so much. There was good reason to make fun of the Earl Scheib paint jobs. As near as I can determine, they still have some Earl Scheib paint shops around, though none in my town any more. @HR – No one remembers those “Earl Scheib 29-95” commercials any more. But I do. Back when I was 9, my stepfather drove our car across country with me. I-40 was just being built, so most of it was 2 lane Route 66. And of course we hit sandstorms in Arizona. So once we got to California (he was transferred to SD Naval Base), my mother took the car to “Earl Scheib” and got one of those “29-95” jobs (The military did not pay NCOs well even then). My mother hated it! She said it was the nastiest shade of green she ever saw! But I do remember those commercials. Well I did Earl Scheib one better, I put an emergency paint job on it with a box full of spray cans. If you are careful, you can get a half descent paint job with spray cans but it does not last, and it takes a long time for the hands to stop cramping. That spray button gets really hard to push after about the 5th spray can. That stopped the rust long enough to get me through the winter and for me to do some fiberglass body work and then I sanded and prepped it and spray painted it with gray primer just before I went into the Navy. I never did get it properly painted. My Mom died when I was in the Navy and I went through a real rough time when I got out, and ended up selling it for $300 to a guy that owned a machine shop so I could pay the rent. I often wonder what became of that car. Knowing the guy I sold it too, he probably stripped the engine and and transmission out of it and sent the rest to the junk yard, but it was a fantastic learning experience. I had to solve all sorts of problems and work out solutions all on my own and by asking questions and doing research poking around junk yards to see how various model cars did things like mounted alternators etc. Even if the building survives, it is far rougher on the occupants. A 9 story “City Center” building in the Loma Prieta quake had a TV tossed off a cart into our VP who was giving a presentation. Doors slapping people silly. Rough ride. One the ground floor of a 1 story (slab foundation) it was an easy ride like walking inside a moving train. At home, sill foundation wood frame, lost one wine glass the vibrated off the fireplace mantle. Witt luck, The Big One will knock down a bunch of these things and folks will once again catch clue (or be sued into sense about it). In The Marina District, it was the multi story apartments over parking that fell down and burned. I suspect apartments over open expanse stores will fare about the same. Oh, and the other thing, they are tearing down all the industrial spaces to put this stuff in too. They seem to expect that everyone will work in the retail under their apartments and just sell stuff to each other. No industry needed, one presumes… I suppose as long as the supply of Chinese buyers and illegal immigrants keep pumping money into the area it can keep doing this… until it can’t anymore. @p.g. : Prep and masking is the key, which is why Earl Scheib paint jobs were infamous. Their prep was slapdash and the poor masking was legendary; paint on chrome, glass, rubber seals, and tires. Of course, nobody in H.S. wanted to spend that much time on their $100 beaters and they didn’t want to spend money on their cars. So we also had a few that got their cars painted at Earl Scheib, and then spent their idle time scraping paint with a razor blade. The paint on rubber, glass, and chrome was no joke. The Good Guys come to town in two weeks. Mrs. H.R. loves speed and the classics, but her mobility has been down in the past few years and we haven’t gone down to enjoy the cars. If she’s not up to going this year, I’ll probably go solo as I have missed the last couple of years. Here are the details of the event we attend. There are usually about 6,500 to 7,000 rods and classics with a lot of speed shop vendors. What my wife enjoy is that they group like car in corrals, so the Olds Cutlass 442 corral might have 80-100 Cutlasses from straight restorations to built street racing versions. The ’50s T-Bird corral is huge, too. I always have trouble getting the Mrs. out of that one. @Larry: They always have a Studebaker corral that I like to visit. I always thought the Avantis and Nighthawks were great cars with beautiful styling. Here’s a link to the page of all their events. You might enjoy the day looking at some old favorites and neat hot rods if you find one is going to be nearby. Scroll down for the upcoming events. The events are listed in calendar order. P.S. I see there are upcoming events in California and one in Loveland, Colorado. @HR; I am well aware of the quality of an Earl Scheib paint job. My first restoration was a 1956 Ford pickup. After completely stripping the metal, repairing and priming it, I took the vehicle to Earl Scheib in Oakland for the finished paint job, $98, Guaranteed not to chip, warp, crack or peal. After I got it back to Alameda a hand size piece had blown off while on the freeway, they had also painted over a splash of road grease . Somehow the warrantee had evaporated out of the glove-box that week. I got a rattle can of the correct color and repaired the paint job. This was just before Bondo. My next restoration was our Scout and I got to learn how to use Bondo, Wow! that was way easier then lead and body glaze. And I learned about painting. The next project, My brother had wreaked my big truck on his maiden trip. We bought it back out of “Totaled” And I rebuilt and painted it in the ranch shop that winter and had it ready for the next season. Good thing he did it on the last trip of the year. We made money that winter in spite of the wreak. All learn by doing as there was no one available to instruct me. LOTs of mistakes and do it over! Mostly just a lot of hand work. On the truck rebuild, lots of welding and grinding so we bought a Sears 8″ offset grinder and used it. A week! it died. Sears replaced it and that one lasted a week. My father took it back, they gave him back his money and suggested he buy a good grinder. He went to the NAPA store and got a “New Briton” and it lasted nearly 20 years. That shell was indeed a work of art. 👍👍 My great-grandfather was a wagon and carriage maker (my two brothers and I have taken turns possessing his tools). I was suitably wowed by your wooden framework. While catching up just now, I couldn’t find anything on the project past the point where you almost got zotted by the plasma bolt and your analysis of the design flaw. Is there more to the tale? At a minimum, if you remove the innards to try again, you have one of the world’s coolest gazebo tops to sit under, sip a beverage of choice, and enjoy the wood work. Let me know if I missed the links to more of the chronicles. Ah! Paint-and-body work… I had a 1970 Toyota Corona that had so much needed a paint job pretty bad. A graduate student (engineering) who was a friend of the guy I was dating offered to paint it over the weekend if I would feed him. And buy the supplies. So it took a full week to do all the prep work. He really took his time and I was able to appreciate how smooth he got it. It was amazing! And it got a lovely shade of Candy Apple Red to finish the job. I fear they are moving that direction in my burg. I read about how there are developers set to build apartment buildings (I don’t recall how many floors, but probably at least 4-5) on one of our main drags. That road isn’t in great shape as it is. There is a low place that people used to put their boats into and “fish” whenever we got a gully-washer. Pretty much in the middle of town. That was before they built the storm sewers. I called a sibling and said it was a must-read! I’ve painted fences and houses (inside and outside) along with lots of models of things and the odd outdoor appliance. I think I can do a fair job of it. Then get good with scrapers, sanders, buffers, etc. etc. if my spray technique isn’t smooth enough. As I was quoted $2000 to “do it right”, I’ve got a lot of room in the budget for some tools and stuff.